Journey through the calendar with Marvel's greatest super heroes - one month at a time! The old Parker luck hits hard on Valentine's Day! Ant-Man must March into action on spring break! On Mother's Day, She-Hulk and Wolverine tackle the matricidal Wendigo Sisters! Can Iron Man give a glum Nova a Father's Day boost? There'll be Fourth of July fireworks for the Winter Soldier! In August, Nick Fury is big in Japan! As squirrel meets raccoon, are Tippy-Toe and Rocket heading for a Fall? Kate Bishop faces tricks and treats on Halloween, the Punisher spends Thanksgiving the only way he knows how, and it's a very special Ghost Rider Christmas! 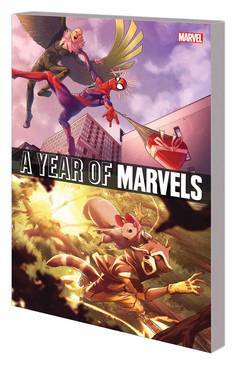 Collecting A YEAR OF MARVELS: THE AMAZING, THE INCREDIBLE, THE UNSTOPPABLE, THE UNBEATABLE and THE UNCANNY; GHOST RIDER X-MAS SPECIAL INFINITE COMIC #1, and A YEAR OF MARVELS: JANUARY INFINITE COMIC #1. Rated T+.